A desk, fast Wi-Fi and friendly neighbors were once the only things we could hope for from a good co-working space—but, oh, how times have changed. 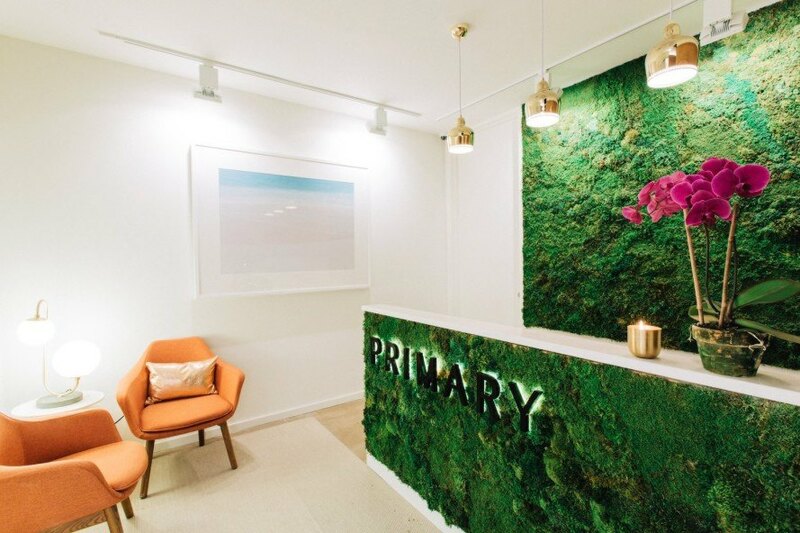 Manhattan’s newest co-working space, Primary, offers a chic environment that boasts a myriad of health and wellness benefits, from a fitness studio with yoga and meditation classes to catered lunches from Dig Inn. Green design is woven throughout the contemporary co-working space, which is punctuated by air-purifying plants and green walls. Located at 26 Broadway in the Financial District, Primary was founded by former WeWork employees Lisa Skye Hain and Danny Orenstein. The modern, 25,000-square-foot workplace is marketed as the “first co-working space that blends health and wellness into the workplace,” an idea that sprouted from the belief that productivity is tied to healthier living. Primary comprises 66 offices and 108 co-working seats with capacity to accommodate 324 people, as well as a 600-square-foot fitness studio that offers over 30 classes a week in yoga, meditation, and functional fitness. Plants liven up all corners of Primary and take the form of green walls, moss walls, and formal arrangements provided by local vendors Greensulate and Brooklyn Plant Studio. Original furnishings, such as bespoke light fixtures from Etsy vendors and custom-designed office furniture by Orenstein and Brooklyn millworker Iron Oaks, add unique character. Patrons of Primary will also enjoy espresso service from Stumptown Coffee Roasters, juices from Lulitonix and Pure Green, Dig Inn-catered lunches, in-house body therapy practitioners, private showers, changing rooms, and bike storage. Located at 26 Broadway in the Financial District, 25,000-square-foot Primary was founded by former WeWork employees Lisa Skye Hain and Danny Orenstein. The modern workplace is marketed as the “first co-working space that blends health and wellness into the workplace,” an idea that sprouted from the belief that productivity is tied with healthier living. Primary comprises 66 offices and 108 co-working seats with capacity to accommodate 324 people, as well as a 600-square-foot fitness studio that offers over 30 classes a week in yoga, meditation, and functional fitness. Plants liven up all corners of Primary and take the form of green walls, moss walls, and formal arrangements provided by local vendors Greensulate and Brooklyn Plant Studio. Original furnishings, such as bespoke light fixtures from Etsy vendors and custom-designed office furniture by Orenstein and Brooklyn millworker Iron Oaks add unique character. Patrons of Primary will also enjoy espresso service from Stumptown Coffee Roasters, juices from Lulitonix and Pure Green, Dig Inn catered lunches, in-house body therapy practitioners, private showers, changing rooms, and bike storage.